This is how police officers are tonight sleeping as they arrive in the capital to assist a depleted Metropolitan Police as American president Donald Trump arrives. Giant warehouses are lined with beds – and in some cases simply mats on the floor. Scotland Yard has lost 20% of its budget since 2010 despite population growth rising by around 100,000 per year. Much of that was when Theresa May was Home Secretary. Boris Johnson tried to balance the books by selling off police stations across London, which Sadiq Khan has continued. That outlet is running out. Many have blamed Khan for London’s recent spike in crime though it’s by no means limited to London, and cuts are nationwide. Criticism of policy is another matter but hard finances count too. London’s Mayor only has limited means to raise income and stem the loss, as do areas across the nation. Central Government has cuts funds and then said to local Crime Commissioners and Councils (or Mayor in London’s case) across the country that they need to make it the difference – yet the ability to do so is limited. 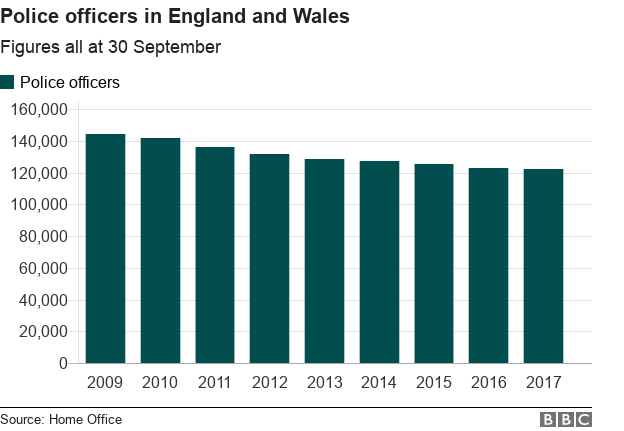 And so the UK is 20,000 officers down since 2010 and are now sleeping on bunks for three days as resilience is cut. It doesn’t end here. The Met now needs to find a further £325m in annual budget cuts by 2021-22. Across the UK it’s at least another £700 million. Perhaps if the liberals whom oppose trump were not so aggressive and violent then we would not require such a vast amount of policing for the visit. The media continue to feed any moron who will listen with anti-trump rhetoric, and this is what it results in. Still, a balloon of POTUS will be sent up, so that should help things. Sounds like you too have been ‘fed’ by the media – suggesting all ‘liberals’ are aggressive and violent. It isn’t just liberals who oppose him – he unites people with his toxic attitudes. To be fair, I can’t see where he suggested ‘all’ liberals are aggressive and violent, but there is a noticeable fraction (i can’t say what %) of the far left that are violent and have no respect for opinions that differ from their own. I had the unfortunate experience of being confronted by some of them (Stand up to racism who have links to the SWP, trade unionists & Labour party) at the East Lewisham hustings at Catford, which the police had to shut down. Nge, you voted for police cuts then?